Home / Fishing / Why Aren’t They Going? A couple weeks ago, I was supposed to be on a 2 day offshore trip on Tomahawk Sportfishing. The trip ended up getting cancelled(Bluefin Excuses). We were a little light on the boat’s break even number to go and the weather was supposed to be up. Rather than go light with poor prospects, the owners cancelled. I’ve noticed a lot of that going around lately. 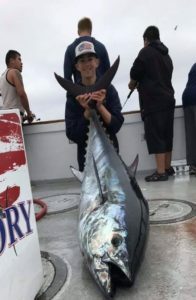 Boats looking to go offshore targeting bluefin are going out light, or not getting out at all because of the lack of enough headcount to make it work. All the while, it seems like at least one boat hits limits every week. And every week a trip or two puts a few giant, fish-of-a-lifetime size fish on the deck. Take this week for example… the Pacific Queen had limits for 24 anglers (above) with fish from 60-90 pounds! And the Old Glory boated a cow (right) that weighed in at 211.8 pounds! I’ve posted a lot of those aerial pictures of the SAC plane view of big foamers of bluefin. Lately, those aerial pics have translated into eyewitness videos of these foamers as a boat is sliding into a stop. So what gives? Why aren’t people going fishing? 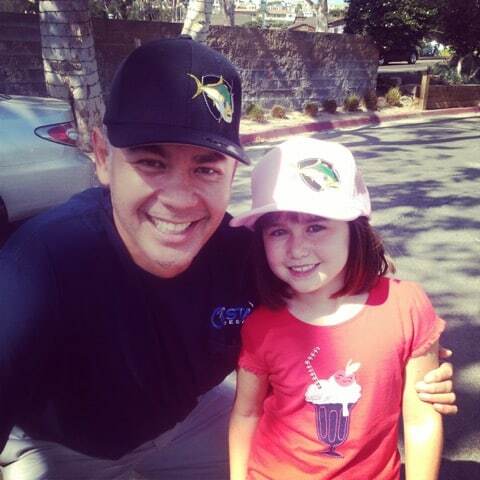 What are your bluefin excuses? I posed this question to the folks on my So Cal Salties facebook page. I was pretty overwhelmed at the response. Clearly, it hit a nerve in the community. A lot of it was pretty much what I expected, but there were some interesting things I hadn’t considered. I’d group some into the “bluefin excuses” column, but I feel a lot of the feedback is legit. Either way, it’s food for thought for all interested parties to consider. I don’t have the gear. I put this one in the bluefin excuses column. Good gear is available at the landings for rent. I know Seaforth and Fisherman’s both have “big game” gear for a very reasonable price. I chose to invest in a 100# setup during Fred Hall. Retail on a rig like that is going to set you back about $1000. For the same amount of money, you could go on 2 day-and-a-half trips… using quality rental gear. It’s hard to justify buying your own when it’s not gear you are going to use a lot. Why not rent? 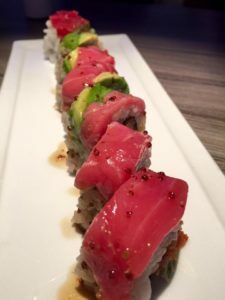 Couple different spins on this one… One was “I don’t like eating bluefin” and its cousin, “I don’t know how to cook bluefin.” Either way you go, sorry but I’m not buying it. I strongly believe that the fishing we do is very sustainable. Anyone that goes, knows. You run into a school of thousands of fish, hook a few and land less. That said, as whole, bluefin may be the most overfished species in the world. The worldwide demand for bluefin is a product of the fact that sushi is delicious. Some of my salty friends are pretty amazing home sushi chefs. But if you can’t already DIY home sushi treats like Billy Keleman (left), there’s YouTube. Poke or sashimi don’t require the same level of knife skills and presentation as sushi, while still being amazingly delicious! And a restaurant will never compare to fish you had the satisfaction of catching yourself. I was a little bit surprised to find out how many people come in from out-of-town to go fishing with us here. Not just driving down to San Diego from Los Angeles like me, but coming in from Northern California, Arizona, Nevada and points beyond. The offshore trip I had on the New Lo-An this year, I fished with anglers that came in from Vegas and Utah. It’s already a high dollar outing considering the cost of a ticket, meals, and gratuities. If you are like me, you don’t like rushing down to San Diego in Friday rush hour traffic to be that guy everyone is waiting on. So I typically take at least a half day off from work. When you add it all up, the average angler may only be able to afford 1 or 2 shots offshore per year. 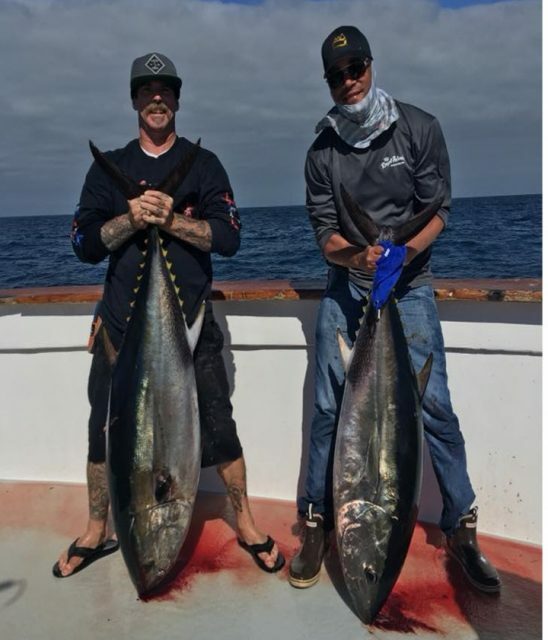 Going back to “I don’t like bluefin” many said they are waiting until yellowfin and dorado are in play because laying down the funds to go and then skunking because bluefin were being bluefin is a tough pill to swallow. The opportunity to be that lucky one or two that actually catches the fish of lifetime aren’t odds many are willing to accept. I get that. I also think that after three years of El Nino, anglers are already a little lighter in the wallet (or maybe significant others are calling for a re-allocation of funds? ), compounding the situation. Not sure what owner/operators can do beyond treat their customers that do come out really well and pray the fish want to cooperate. Hopefully something changes in the calculus soon. The fish are in overnight range and it seems like they are starting to bite better. That should definitely help. I’m still bullish about the opportunity available to us. I feel like it’s going to be around for awhile, but you never know how long these things last. I’ve got trips coming up, but if you don’t you should set aside part of your sportfishing budget to give these fish a shot. Get your buddies together, make a plan, and go. San Juanito On Fire – Big Tuna!